Fed Chairman Ben Bernanke continues to take a lot of heat for employing ultra-easy monetary policy in his efforts to address the Fed’s dual mandate of keeping unemployment low and inflation moderate. “My inflation record is the best of any Federal Reserve chairman in the post-war period, or at least one of the best — about 2 per cent average inflation,” said he said to Senator Bob Corker during his testimony this morning. CPI may be tame. 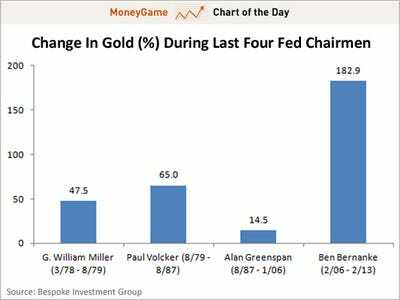 But this hasn’t kept people from buying up gold, which some consider to be a proxy for deteriorating purchasing power. Of course this doesn’t account for other factors like emerging market demand for gold.